Nairobi — The scars from their 1-0 loss at the hands of Kariobangi Sharks in the season opening Kenyan Premier League Super Cup are still fresh on Gor Mahia's minds as the two sides prepare to clash in a league tie on Saturday at Kasarani. 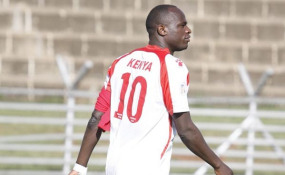 Sidney Lokale stepped off the bench to score a second half winner as Sharks picked up a win against the record Kenyan champions, twisting further the knife on the side's flesh having eliminated them from the Football Kenya federation Shield in October. New boss Hassan Oktay watched the 1-0 Super Cup loss from the stands having arrived just a day before and he says he felt Gor should have won the game on the balance of chances. But now, Gor are walking back to the tie breathing the fire of revenge, their aim being to get their bodies back to rhythm after a disappointing exit from the CAF Champions League. "I was on the stands during that game and I watched as we created so many chances but we didn't score. Sometimes you have to learn from mistakes and improve the team." "My team is ready; every game for us is important. Every team raises its tempo when playing against Gor and we are ready for them tomorrow," the tactician stated. The tactician has stated that his boys have put behind their backs the loss to Lobi Stars which he says came under severe conditions including denied penalties, mistreatment from the hosts and several other factors outside the pitch. "That is behind our backs now and we focus on what is ahead of us. We have the league which we have to fight for and we also have to try and get to the group stages of the Confederations Cup," Oktay further added. The coach has also not let transfer rumors affect his team with striker Jacques Tuyisenge said to be headed out of the club to Congolese giants AS Vita while midfielder Humphrey Mieno is reportedly being courted by Ethiopia's St. George. "We have heard those rumors but so far, nothing concrete has come to the club. I am happy because the players have their concentration with Gor Mahia," Oktay noted. He added that he has made his feelings known with the club management that he wants to retain all his players. "I want to keep all my players because we have a lot of games this season in a short period of time with injuries coming its important to have our players remaining with us," the coach noted. Gor have lost once against Bandari and won 4-0 against Zoo Kericho in their opening two games of the campaign. Sharks walk into the tie fresh from a 0-0 draw awau to nzoia Sugar last Tuesday and are also nursing the blues of exiting the CAF Confederations Cup. Sharks are placed fifth in the standings with five points off two draws and a win.